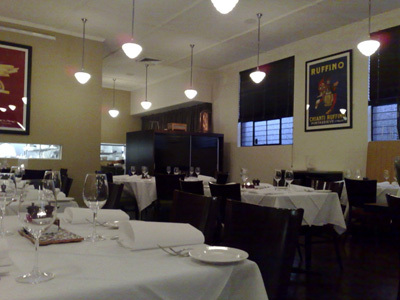 We're continuing with our Italianish theme and have headed to Church Street Enoteca for dinner. It's a very pleasant surprise to see a familiar face here - restaurant manager, Alastair. Now Alistair used to work at Fenix but left about 8 or so months ago - now we know where he went! Since we're in an Italian mood, we began with Prosecco rather than Champagne. It's not offered by the glass, instead you get those cute little 200ml bottles. Unfortunately the Prosecco wasn't quite to our liking - next time we'll try the champagne. To enjoy with our meal we eventually select the Cerasuolo di Vittoria 2004 from Sicily - it's a 60/40 blend of Nero d'Avola and Frappato - it's quite the interesting wine. 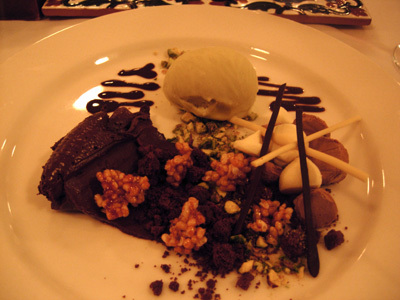 We were forewarned that this was a rich dish but the description was way to enticing to skip. It is a luscious dish and Paalo found it very hard to resist soaking up those juices welling at the bottom of his bowl withh bread. There's acid, sweetness, creaminess and tartness - a wonderful balancing act. 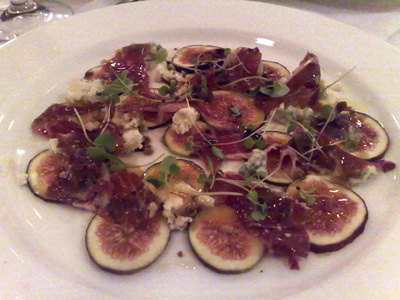 My Choice: Sliced Figs with Gorgonzola and Iberico Jamon drizzled with lavender honey and a scattering of micro herbs. 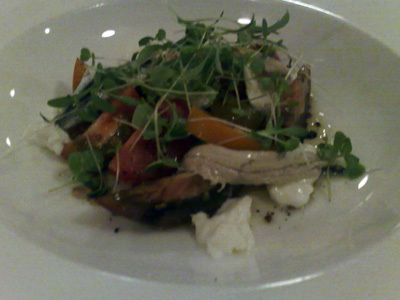 This is the type of dish I love - uncomplicated yet offering a variety of tastes and textures. The soft shards of Jamon were perfect examples of the best of Jamon - a strong nutty taste perfuming the flesh. The Gorgonzola adds a salty creamy character while the figs and honey bring a sweet perfume to the dish. A timeless combination made with excellent quality ingredients. 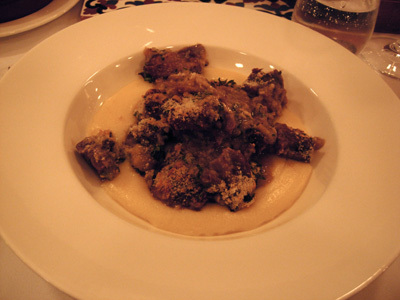 This comes to the table in two parts - the bowl of soft polenta is placed before you and the lamb comes out in it's fry-pan, topped with browned parmesan breadcrumbs where it is then served onto the polenta. 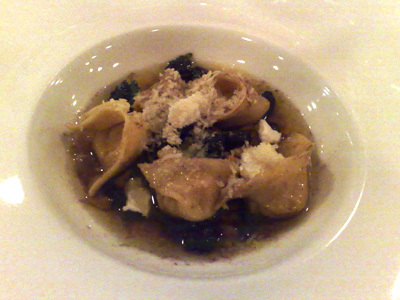 A good rustic dish - the polenta was soft but with an appealing grainess to the texture. The lamb was flavoursome, tender and well-cooked. 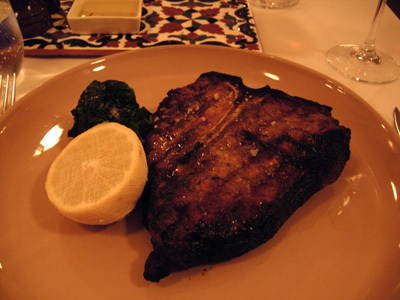 My choice: Bistecca Fiorentina - salt crusted King Island Black Angus t-bone served with nicola potato mash, spinach and lemon. The menu tells us that this is dry aged for 45 days before it's boned and then aged another 7 days before it's portioned. 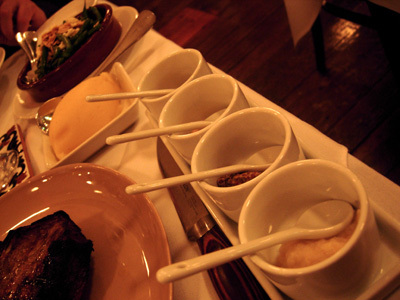 The restaurant then dries the steaks in their cool room for at least 48 hours before they can be served. 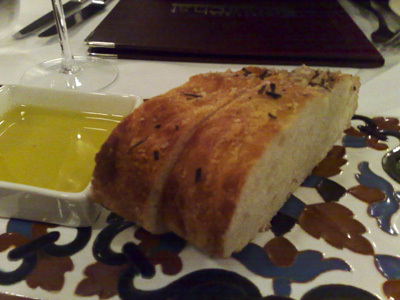 The last time I had Bistecca Fioretina was in Florence and this was made with a similar feel. Once again, it's excellent produce that has been well cooked. 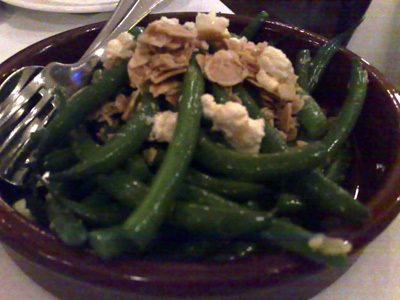 We also ordered a side dish of Steamed green beans with toasted almonds and marinated Persian Fetta. 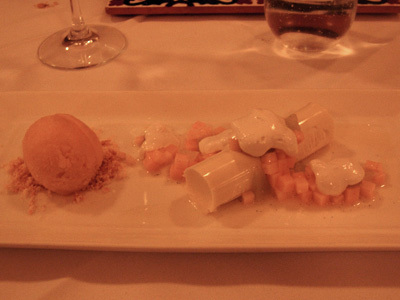 Both desserts were impressive - certainly not what you'd expect and far removed from your typical traditional Italian dessert.